If you've been rescuing unwanted pets on your own but want to do more, consider starting a nonprofit animal rescue. If your organization receives 501(c)3 nonprofit status from the Internal Revenue Service, donor contributions become tax-deductible and you can apply for grants from various foundations and government agencies. That means you can help more animals find loving homes. Visit the IRS website for information rules regarding nonprofit organizations and download forms for starting a nonprofit from the site and instructions on how to fill out the forms. Check with your state's attorney general's office for nonprofit organization's reporting rules and requirements, including the number of directors a nonprofit must have in your state. Ask your secretary of state or AG's office for information on how to form a nonprofit. You must make sure your proposed organization's name is not already taken. If it is, you must find another, suitable name. Your group can file for nonprofit status itself, or hire an attorney. You must file the articles of incorporation with the state, designating an individual as a registered agent and an address for your organization, then send a copy of your articles of incorporation and a federal tax exemption application to the IRS. On both the state and federal level, you must pay any applicable fees. After submitting the paperwork to the IRS, it could take six months or longer for your organization to receive nonprofit status. Your nonprofit organization requires a board of directors. That can be tough if you've been a one-man band, making decisions about rescued pets on your own. Your board makes the decision regarding the mission statement and bylaws. Your board should be made up of animal lovers with skills that go beyond pet rescue and fostering. If possible, find a veterinarian and attorney to serve on the board, along with individuals with fundraising and grant-writing experience. You and your board must formulate a mission statement and by-laws for your operation and for the public's benefit. The statement outlines and specifies your basic goals. For example, do you intend to rescue both dogs and cats, or focus on one species? If your rescue concentrates on one or more breeds, that's part of your mission statement, as is the geographic area from which you rescue and adopt out animals. Your board can revise the mission statement over time if it wants to expand or change your rescue goals. Your bylaws govern your organization. You can use a template of a similar organization's bylaws to create your own, but don't copy it word-for-word. The bylaws include rules regarding members, meeting schedules, number of people on the board and officers and their election and terms, resignations and filling vacancies, any compensation and standing committees. They also outline the duties of board members and officers and their indemnification. Bylaws are usually adopted at the board's initial meeting. How Long Can a Nonprofit Operate Without 501(c)(3) Status? Can I Make Money in a Non-Profit? Animal rescues need volunteers. While not everyone can foster an animal, volunteers can put their particular talents to work to help the organization. You might find volunteers online through social media, local dog training facilities and breed clubs. Develop an email list or Facebook page for volunteer information and updates. Put up flyers at local animal-related businesses such as pet stores and grooming salons. Have volunteers fill out a form designating their interests, areas of expertise and availability. Fundraising is a constant part of running a rescue. Fortunately, methods for raising funds are endless, but you need volunteers to coordinate and run them. New rescues can start with old standbys like yard sales, bake sales, donation bins at local retailers and tables at local fairs and other events. Ask local businesses, especially those selling pet products, to sponsor your rescue or otherwise contribute. Other low-budget fundraising events for new rescues include dog walks or runs, offering sponsorship of specific pets until adoption or selling 50/50 raffle tickets. While volunteers can foster animals at home, your rescue must have a policy in place regarding any compensation for any expenses. 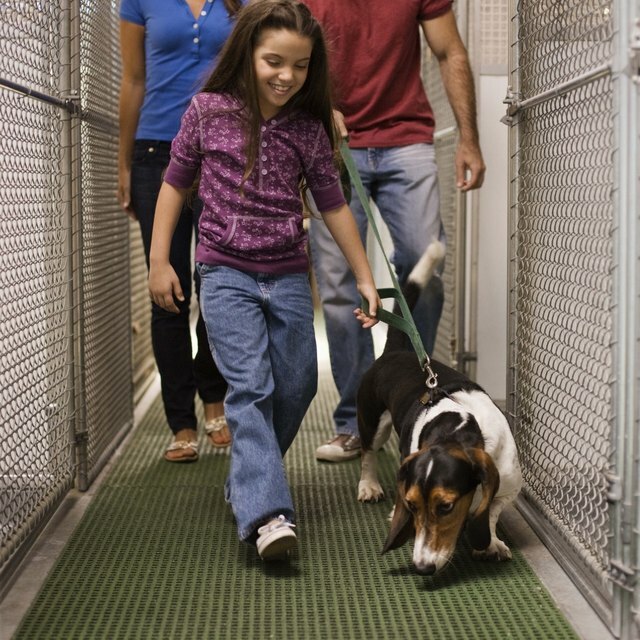 As you grow, you may be able to rent a kennel or similar space to temporarily keep animals until a foster or permanent home is found. Your rescue must develop an adoption contract, which includes adoption eligibility and any requirements, such as a home visit prior to adoption approval or return of the animal if the adopter can no longer keep the pet.